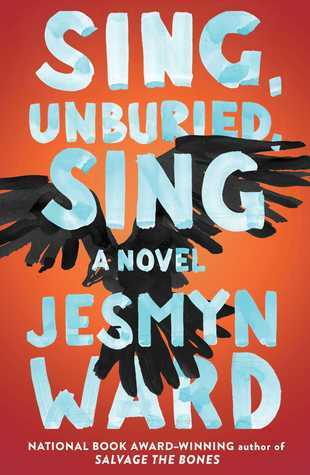 I like to think I'm being thematic by reading this book at the beginning of Black History Month, but the fact is that I've been wanting to read Jesmyn Ward for years. Salvage the Bones was a Big Deal when it came out, but there are dogs in it, pit bulls, and I think maybe bad things happen to them? It put me off a bit. 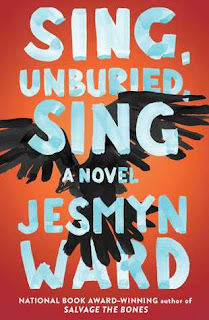 But then this book came out and everyone raved about it and I didn't get around to reading this one either for a while and now it's made its way onto my 2019 TBR Pile Challenge list. And now may go back and read Salvage the Bones too, even though it may rip my heart out. I think maybe that's just what her books do. The story takes place in Ward's home state of Mississippi. Jojo is a thirteen-year-old boy, fiercely protective of his younger sister Kayla, who also lives with his grandparents and his mother, when she's around. He calls his mother Leonie and his grandparents, Mam and Pop, are more like his parents. His white father, Michael, is in prison. But he's getting out and Leonie packs up the kids and her friend Misty to go on a road trip to pick him up. Things don't go terribly well. Kayla throws up all over the car, for starters, which makes everyone miserable. Leonie thinks she can heal her with plants, but Jojo doesn't trust her. They spend the night at Michael's lawyer's house where the adults all get high together while Jojo watches over the sick Kayla. I've mentioned that Jojo's father is white, and this is significant because Michael's father, Big Joseph, is extremely racist and will not accept that his son is in a relationship with a black woman. There's also some family history here that I won't get into but it shows even more what kind of person Big Joseph is. I can't believe I've gotten this far without mentioning the ghosts. Leonie's brother Given, who was killed at a young age, appears to her when she is high, which is part of the reason she keeps doing it. Pop (who by the way was possibly my favorite character) told Jojo stories about his time in Parchman, the same prison Michael is being released from. Some of these stories are about a boy named Richie, who was Jojo's age then, and how Pop tried to look for him at the prison. On the car trip, Richie appeared to Jojo and talked with him along the way. I don't know if I should use the word "ghost" to describe these appearances of dead people, but since they are dead people appearing to (some of) the living, that's basically what they are. Leonie is not the mothering type, her awareness pretty centered on Michael. The kids were always frigging hungry in this book and she didn't think to feed them, or, it was almost as if she didn't want them to eat. Michael was her priority, and getting high. I kind of hated her for how she treated her kids, but also really felt for her in some ways. Losing her brother was horrible, and being in love with a guy whose family hated her (for no good reason) was also terrible, and her mother was dying. It's no excuse to treat your kids the way she did, but I do think she actually felt a bit of affection towards them. She just screwed up early and now they don't go to her for comfort or really even trust her. I have such mixed feelings about her but I can say for sure that she felt real. All the characters did, even the ones who appeared just as ghosts. The perspective switched between Jojo, Leonie, and Richie so you get a much more full story than you would if it was just from one of them. Everything about this book felt real, in a raw and gritty way. It wasn't an action-packed story, but had a lot of momentum that just propelled me through. The chapters were short and that made it go faster too. It only took me a few days to read but I imagine I'll be thinking about it for much longer.